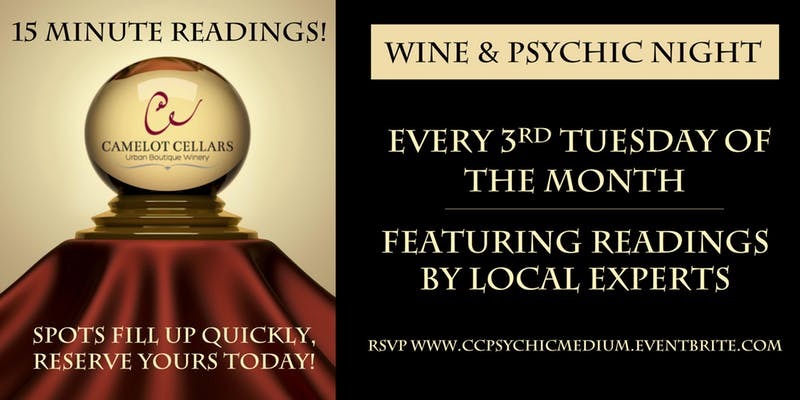 Join us on Tuesday, February 19th from 6-9pm for our monthly Wine & Psychic Night! Find out what your future holds and try a glass of specialty wine from Camelot Cellars! Click on the ticketing link to reserve your spot! We have a roster of talented and entertaining psychics using various divination tools including palmistry, tarot, numerology and astrology, as well as psychic mediums who communicate with the other side. Our readers are experienced professionals who offer insight and advice on life, love and happiness. Each reading is a total of 15 minutes. Limited one time slot per person. Your $5 ticket reservation goes towards the reading cost of $25 (final reading payment due at the time of event). Slots will be filled on a first come, first serve basis, so it is suggested to arrive early!